Painter, graphic artist and industrial designer, Géza Faragó's richness of ideas, and posters full of original humor in Art Nouveau, had a great influence on the development of Hungarian posters. One rather interesting episode in the history of Hungarian industrial culture is the fortuitous meeting between the United Lamp and Electric Co (trade name: Tungsram) founded in 1872, and Faragó was one of the most popular Hungarian poster artists at the turn of the century. It was a success story that established a lasting reputation for the factory and artist alike. 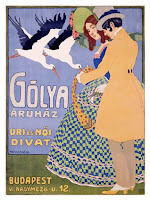 Faragó's early career as a textile designer is evident in this decor- atively-patterned poster promoting men's and women's fashions at Budapest's then-elegant Golya department store (golya is the Hungarian word for stork). Géza Faragó was a pupil of Mucha and Colarossi in Paris in 1898. On his return to Hungary, his works were exhibited in 1900. After another stay of some years in Paris, he became a pupil of Adolf Fényes in Szolnok, and Béla Iványi Grünwald in Kecskemét, then settled down in Budapest around 1905. He designed stage sceneries and cartoons. His posters were exhibited in Berlin in 1914. From 1910 to 1915 he was a stage designer at Király Theatre, at the Operetta Theatre, Budapest, and later at UFA Studio. "Hungarian Wedding", a ballet, was on in London for a year. His most famous posters include "Gottschlig Reem", "Törley Champagne" (1909), "Kerpel Hand Moisterer" (1910). His works were exhibited in 1910, 1923 and 1928. "Evening by the Danube", "Early Moonshine", "Morning" and "Peasant Girl in Seelfeld" are in the collection of the Hungarian National Gallery.He specialized in costume design, working at theaters in Budapest and Vienna, and many of his paintings hang in the Hungarian National Gallery.